3 speed transmissions- how do they work? I'm pretty familiar with the normal 2 speed transmissions with a oneway on the 1st gear and a centrifugal clutch on the 2nd. However, it wouldn't seem to work in my brain if I stack an additional stage as a 3rd gear. They work with the other option how to shift which was used in the old BMT and still is used in many RTR cars like the HPI Nitro RS4. There is no clutch shoe but a small lever arm. Still that one is going out due centifugal forces and will grab itself in a notch on the 2nd speed gear adapter. When the 3rd speed is engaged the rotation of the 2nd gear is the right direction so the notch will slide over the lever arm. 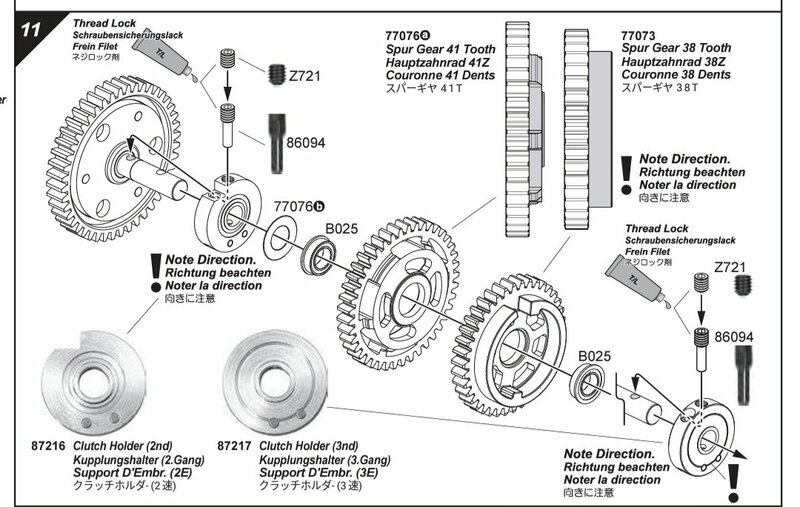 Look up the HPI savage 3spd and Kyosho Mad Crusher 3spd manuals. Last edited by 1/8 IC Fan; 04-17-2019 at 09:17 PM. Man... I miss HPI being a good brand. Last edited by bertrandsv87; 04-22-2019 at 04:15 PM.